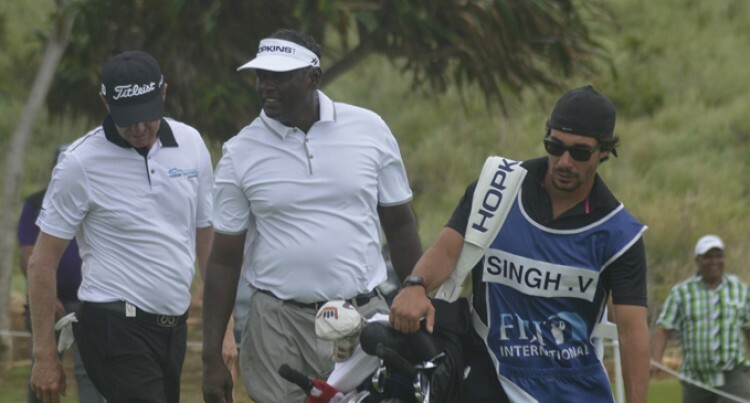 Former world No.1 Vijay Singh is tied on sixth spot after Round Three of the Fijian International at the Natadola Bay Championship Golf Course yesterday. He shot one under par 71 much better than his previous two rounds (78, 75) for a total score of 224 (+8). Singh is in sixth spot with Ryan Haller who shot two under par 70, Peter Wilson even par 72, James Nitties even par 72, and Scott Laycock who carded a two over par 74. “It was enjoyable and the greens were more receptive and you could stand over and putt, that is why the scoring was good,” he said. Singh shot four birdies ( 5, 6, 14, 17), 11 pars and three bogeys (1, 7, 12). “I’m happy with the 71 and hope to shoot another low number tomorrow (today),” he added. “If it stays like this then it will be possible but you will have to take some risk and survive.” He said the green was very easy to play and hopes that will be better than the two earlier rounds which he classified as brutal. do on some of the holes when it was blowing a bit,” Singh said. “Clubbing was a bit different and difficult because our mindset was on what happened on the first two days and the practice rounds. He tees-off at 9.25am alongside Peter Wilson and James Nitties from hole one.